Some of those sure bring back memories. This are songs that I knew all the lyrics too, which I really enjoyed. In fact I really enjoyed this album. Do I prefer the original recordings of these songs? Yes. 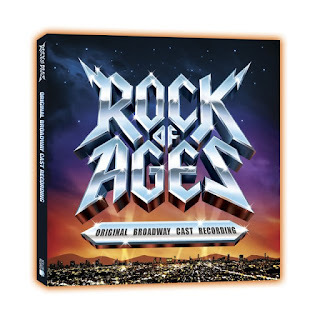 But, I love musicals and when you are in the mood to listen to a show rather than an album, this is the disc to pop in. Ashley and I think it is second only to our Mamma Mia cast recording cd. I think it's the perfect music to clean house, dance, sing, and be silly to! We had a blast with it! If you want to buy your own copy, click on over to Amazon. What is the show about you might ask? Well, Rock of Ages is the new Broadway musical starring American Idol finalist Constantine Maroulis. Set in 1987 in a legendary Sunset Strip rock club, a small-town girl meets a big-city dreamer and they fall in love to the greatest metal songs of the 80's. The musical is an arena-rock love story told through the mind-blowing, face-melting hits of Journey, Bon Jovi, Styx, Reo Speedwagon, Pat Benatar, Foreigner, Twisted Sister, Poison, Asia, Whitesnake and more. Check out this video of the making of the soundtrack. It looks like the cast had a blast with it as well!